Awwite now, Bubba, one thang you gotsta under-freakin'-stand is that Kenmore ain't no manufacturer of appliances. Nawsir, "Kenmore" represents nothin' more than a bunch of bureaucrats at Sears who sit around and write specifications of and haggle over the price for someone else to make their stuff for them. Period. There ain't no "Kenmore" factory somewhere in Malaysia or anywhere else. So, who makes Kenmore stuff? Well, lots o' folks. You can tell by looking at the three digit number to the left of the decimal point in the model number. Did I slide that'n by y'too fast, Slick? Read it again: the three digit (that means individual numerals) number (that means sequence of digits) the left of (that means not to the right of) the complete model number (which is a big ol' hairly long ace number). Still confoosed, Grasshopper? Let's take a ezzample. S'pose I gotsa Kenmore refrigerator (or "refirgerator" for the keyboard impaired) with a model number of 363.58097890 and I need to know who actually made that fridge. Well, using Figure 1, above, I look up the "363" portion of the model number and, lo, GE done made that fridge! It's just like FM (freakin' magic), ain't it? No disrespect intended.... just wanted to include Frigidaire in your Kenmore list. That's sweet, an' all, but they're already listed. You can probably see it better if you click the picture for the larger view. And here's an even better and more detailed list, in numerical order so much easier to find what your looking for. can the numbers on kenmore appliance tags (incl but not ltd to model & serial) be completely decoded? what does the model number indicate besides the mfrs prefix? does the entire serial number identify the unit its attached to or only part of it? if part, which part & what do the remaining digits indicate? is or will there be code evidencing energy star compliance? Model number - AFAIK, no significant info other than manufacturer. 34567 - 34, 567th to roll off the line that week. Any of the current Sears people on here should be able to expand on the list (it was in the Process Manual...if it still exists). Thank you for your reply. What is a film card? Micro fishe, the film cards we buy from the people who make appliances and insert into a viewer to read them, much like you can read old newspapers in a library when they are stored on film, however these 4X6 film cards. Look up breakdowns and part numbers, they are going the way of the gas guzzlers since most of the information is available on line or on CD's now for the newer stuff, however the older stuff can only be found on the old film cards. Your range breakdown is available still on the Sears site but it did not give any date when it was put in their data base online. 100 roper,101 roper,103 roper,106 whlp, 110 whlp, 119 athens range,123 thermador,126 absocold,154 whlp range ,whlp=whirlpool by the way,155 preway,159 loth stove,174 caloric,196 brown stove,198 whlp freezer,253 gibson,267 knox stove,362 ge range,363 ge ref and dishw,417 frif stack w/d,562 whlp range,587 d&m dishwasher,596 amana,628 kel,647 roper,665 whlpcompactors and dishwashers,747 litton m/ws,769 addison,790 frig range,791 frig range,850 chambers,911 roper,960 caloric. now gimme a beer man lol! I have a kenmore model number 63016303400 and lost the manual. I'm trying to find it on line but so far no luck. Who makes this? I don't see 630 on your chart. Thanks. Does anyone know who makes dishwashers in Canada for Kenmore with the prefix 223? 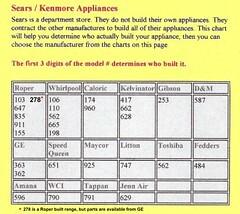 Sears Canada uses two different numbers to describe Kenmore appliances. For example the Kenmore Dishwasher listed on sears.ca as "223 616 052" is actually model number "665.16052402" which according to this thread is a Whirlpool, and based on a recent recon, it appears to be a Kitchen Aid variety of Whirlpool becuase the Turbo-Zone feature only appears on Kitchen-Aids. So, you ask, where can you cross reference the 223 number to the 665 number? The only place I could find the 665 number was inside the door of the actual unit. So looks like you will need to go back to the Sears show room. The US Sears website lists the same model as "Sears item #02216052000 Mfr. model #16052" so that is no big help either. One other thing. Effective now Sears is reducing the warranty period on all non-premium appliance brands to ONE-YEAR. Jenn-Air and Kitchen-Aid are not affected, but Maytag and Whirlpool are (for example). One of our customers bought a new KA dishwasher from Lowes last week and they told her flat out it only had a 1 year warranty total so not sure what is going on. I believe the technical term is "oligopoly". 110 just tells us these were mde by Whirlpool, might need the rest of the model numbers..
On the dryer, 1999 week 31 - on the washer, certainly pre-1991, when the new numbering system came in.